100% pure pashmina stole with shades of sozni work embroidered with beautiful hand work using needle work technique all over the stole making it a piece of art. You can wrap yourself in an exceptional comfort and warmth with this pure authenticate Cashmere Pashmina fabric. This luxurious cashmere pashmina stole is the perfect fashion accessory for all seasons, events or occasions! You will feel as proud as you look since Luxury Cashmere pashmina wool is the finest handmade cashmere stoles in India. It get your Looks stylish and feel wonderful. 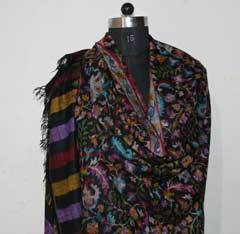 Luxury Pashmina collection of handwoven cashmere Pashmina Kani shawls and stoles from Kashmir at Bhat Brothers. Celebrate the festivals gifting your loved ones to this mesmerizing piece of cashmere luxury stoles made of pure pashmina woven by hands of Kashmiri weaver, it takes many year to weave a single piece of Cashmere Pashmina Shawl and Stole.The Kani technique of Pashmina Shawls involves the insertion of the colored pure Pashmina threads by means of thin wooden sticks called Tojli into the stoles and shawls to create amazing patterns. The colorful and perfectly designed Kani reversible shawls are hand woven by the expert and professional artisans, using the finest hand-spun Pashmina. Each and every piece of pashmina shawl and stole is woven, one stitch at a time, by two professional and expert weavers sitting side by side in the loom. The time taken to weave each shawl may vary and its price, depends on the number of colors used, intricacy of pattern and the tightness of weave.